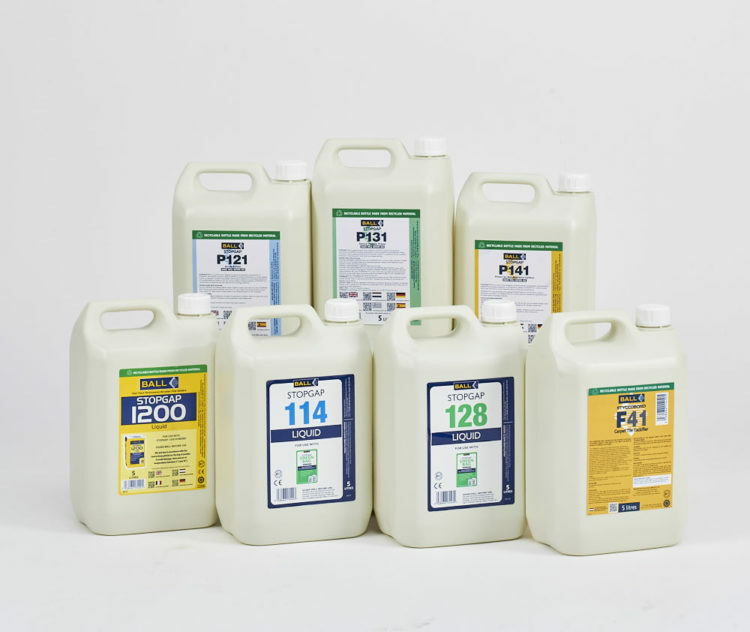 We are proud to announce that we are replacing our traditional 5 litre plastic bottles, used for gauging liquids, tackifiers and primers, with 100% recyclable versions that are themselves made from recycled plastic. The move to the recycled packaging is part of F. Ball’s ongoing commitment to reducing packaging waste and, specifically, plastic waste due to the adverse effect it can have on wildlife and the wider environment; dramatically highlighted in recent press and television reports. The new bottles, which are manufactured from 95-98% recycled high density polyethylene (rHDPE), can be disposed of through the normal waste disposal chain to be recycled. The material can then be recycled up to ten times. In making the switch to recycled plastic, over 100 tonnes of virgin plastic material will be removed from the waste stream every year. Commenting on the introduction of the recycled bottles, F. Ball Managing Director, Mark Hughes, said: “In replacing our five litre bottles with the recycled versions, we have gone to great lengths testing and assessing these new bottles to ensure they are as strong and robust as their predecessors and maintain the quality levels customers expect from F. Ball. It is also important that we can guarantee the products they contain reach the end user in perfect condition. The new recycled packaging will start to appear in wholesalers from October onwards.